Can this 30" behemoth justify its high price? Samsung's awesome 30-inch XL30 is literally the best monitor we have ever seen. But at £2,600 and with just a single DVI input, it's also rather ridiculous. Clever yet stupid is a great comb. It's laughably bad value next to LG's 27-inch M2794D, which isn't far off being 1/10th the price. Thanks to a wide-gamut LED backlight, the XL30 is capable of rendering more colours, and rendering them more accurately than any monitor we've reviewed. It also boasts impeccable viewing angles, fantastic contrast and more than adequate pixel response. Oh, and then there's the minor matter of 2,560 x 1,600 pixels. Truly stunning. 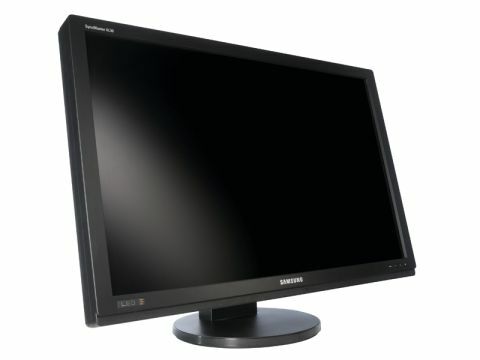 But avoid even looking at an XL30 unless you are in a position to buy – it makes all other monitors seem pretty pony.